Lawrence Weiner, Pamela Sharp, Dennis Oppenheim et al. 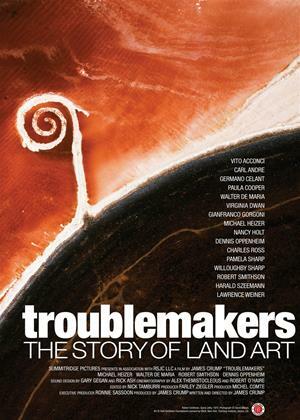 Troublemakers unearths the history of land art in the tumultuous late 1960s and early 1970s when a cadre of renegade New York artists sought to transcend the limitations of painting and sculpture by producing earthworks on a monumental scale in the desolate desert spaces of the American southwest. Today these works remain impressive not only for the sheer audacity of their makers but also for their out-sized ambitions to break free from traditional norms. The film includes rare footage and interviews which unveil the enigmatic lives and careers of artists Robert Smithson (Spiral Jetty), Walter De Maria (The Lightning Field) and Michael Heizer (Double Negative); a headstrong troika that established the genre and who stand in marked contrast to the hyper-speculative contemporary art world of today.